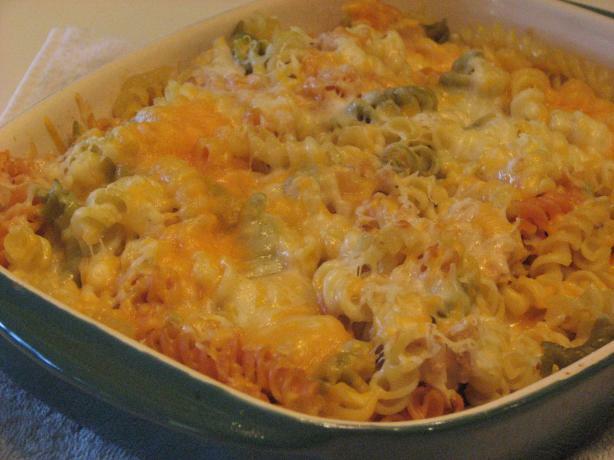 If your kids are bored of the usual tuna sandwiches, make this kid friendly tuna casserole, which will not only be a rich source of protein but will also become a favorite. Utensils: A large cooking pot, Mixing bowl, casserole, oven. Cook 2 cups of pasta of your own choice (egg noodles, macaronis) in salted boiling water for 5 to 8 minutes or until tender. Drain the water from the pasta and transfer it to a bowl containing chilled water. Once your cooked pasta has cooled, drain it into a dish. Pour two tablespoons of olive oil on the drained pasta and mix it well. This will keep the pasta from sticking together. Open two cans of tuna and drain the water or oil in it. Put the tuna into a medium size mixing bowl. If your tuna was packed in olive oil, don’t add any seasoning to it. Simply dice it into smaller pieces using a fork. Mix ¼ cup of minced red onions, 1 cup frozen peas and 1 cup frozen corns to the shredded tuna. Also add parsley and dill for seasoning, but it is totally optional and you can skip both these ingredients. Combine cooked pasta and cheese with the tuna mixture and mix well. Transfer all the ingredients to a casserole dish and bake for 20 to 25 minutes in the oven, preheated at 400 degrees Fahrenheit.